We want your camping trip to be injury-free but sometimes things happen that you’ll need a band-aid for or some over-the-counter medication. 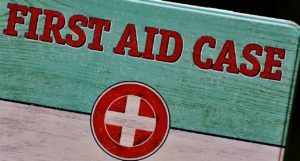 You’ll be glad to have a first-aid kit on board when these things happen and you can quickly remedy the situation. Each family will have its own unique items that should be included but, generally speaking, these are a few things to consider. For things that relate to your skin, muscles, and joints, be sure to have on hand some bandages, gauze squares, ace bandage, antibiotic ointment, ant-itch cream, ice packs, calamine lotion, sunscreen, lip balm and sunburn relief. For your internal workings you’ll want to have antacids, pain reliever, allergy medicine, anti-diarrhea medication, stool softener, cold and cough medicine, and children’s versions for pain and allergy. Make sure to pack tweezers, a small pair of scissors, a thermometer, a small magnifying glass, and any prescriptions needed by each member of the family. Carry your pet’s medicine as well. When it comes to prescriptions, be sure you have enough to last your whole camping trip. A little extra is a good idea in case you get sidetracked on the way home and don’t make it on the day you’d planned. Being ready for anything isn’t easy but these items will cover just about any situation that you and your family will run into. We hope you pack it all and don’t need any of it but, if you do, we’ll be glad you had it on hand and can be back up and running in as short a time as possible. Be sure to check out our member parks for a great camping experience this year. You’ll love camping in Virginia and we hope your return for many years to come. PreviousPrevious post:Do Pets Need Sunscreen?NextNext post:What’s Not To Love About Camping In Virginia?